03:49 — Doctor Who Adventures: DEAD! 08:55 — Doctor Who: China buys TV rights. 12:54 — Star Wars: Bike crash helmets. 14:58 – Doctor Who: World Enough and Time & The Doctor Falls. 47:59 – Doctor Who: Spare Parts (Big Finish). 64:16 – Emails and listener feedback. 92:02 – Farewell for this podcast! 94:14 — End theme, disclaimer, copyright, etc. Amazon.com: HJC IS-5 Star Wars X-Wing Fighter Pilot Helmet. Wikipedia: World Enough and Time. BBC: Doctor Who – World Enough and Time. BBC: Doctor Who – The Doctor Falls. 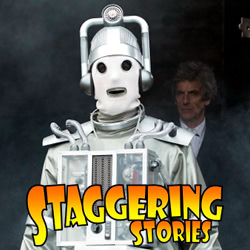 This entry was posted on Sunday, July 16th, 2017 at 10:23 and is filed under Doctor Who, podcast, review, Sci-Fi, staggering stories, Staggering Stories Podcast, Staggering Stories Regular Podcast, tv. You can follow any responses to this entry through the RSS 2.0 feed. You can leave a response, or trackback from your own site.